We can’t say enough good things about all the participants in Sunday’s Northwest College Showcase at Bellevue’s Interlake HS. Dozens of players performed well, and should be proud of themselves for the level at which they competed. Several attendees representing the state of Washington had standout performances on the big stage that are worth recognizing. In no particular order, these individuals were “elite performers” in the QB/WR/DB group. Kevin Thomson – Auburn Riverside HS: He has had one of the better offseasons as far as quarterbacks go and he continued to show it. He’s a returning starter with weapons coming back, and a new coach. Could have a huge year. Nolan Henry – Union HS: The 2015 quarterback is one of the state’s best in his class. Henry is one of the most consistent signal-callers in region, regularly displaying accuracy and a strong arm, and Sunday was no different. Tavin Montgomery – Juanita HS: Montgomery ended up starting for the Rebs as a freshman and looks ready to breakout in his sophomore season. He possesses great poise and command, even in a showcase setting. Ross Bowers – Bothell HS: Bowers is the lone starter returning for Bothell in 2013, but the junior is a dang good one. Bowers have a live arm and showed the ability to throw it all over the field. 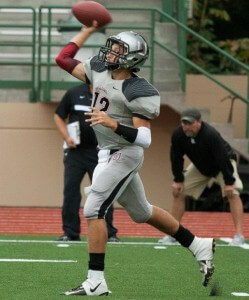 Reilly Hennessey – Camas HS: He showed Sunday why he is one of the top QB’s in the 2014 class. Hennessey has really good accuracy and nice touch on his ball. Kilton Anderson – Skyline HS: The South Alabama commit throws one of the nicest deep balls around. He continues to look good with intermediate throws as well, and has a incredibly strong arm which he showed off Sunday. Jayden Croft – Tumwater HS: Croft continues to cement himself as the most improved QB in the state. The senior throws a good looking ball and his velocity is drastically improved from his junior season. Casey Brink – Bainbridge HS: Like Croft, Brink is used in a run-heavy offense, but has really shown growth entering his junior season. He throws with really nice touch, and showed improved arm-strength Sunday as well. Clark Hazlett – Squalicum HS: One of the top quarterbacks in Northern Washington, the 2015’er will be in his third year as starter at SHS, and looked every bit the part on Sunday. Devyn Rainbow – Bothell HS: As the backup to Bowers at Bothell, Rainbow works harder than most starters in the state. The 2016 QB is poised to do big things when called upon. Dillon Sugg – Wenatchee HS: Sugg is a big QB, who looks the part. He has really nice touch on his ball, and will have no shortage of talent around him for the Panthers to make noise in 4A this fall. Tanner Gueller – W.F. West HS: Gueller is another player who shows a high level of commitment and has improved greatly over the offseason. He’s arm strength and accuracy are both assets, and his leadership is invaluable. Derrick Becker – Olympia HS: The new Olympia QB had a very solid day. He excels throwing short and intermediate routes. Has good velocity and can really spin it. Jonathan Hillel – Mount Si HS: Hillel is an athlete that you may not hear much about this fall, but he threw the ball nicely all day. He’ll backup Nick Mitchell this season, but when it comes time for him to take over, the Wildcats wont miss a beat. Trevor Asbjornsen – Graham Kapowsin HS: Asbjornsen has looked impressive every time we’ve seen him this offseason and Sunday was no different. He is just solid all-around, and should lead GK to a big year in the SPSL. Jake Taylor – Gig Harbor HS: The Gig Harbor transfer continues to improve his game. He has ideal size, and had a really nice showing Sunday at the showcase. Hunter Wendling – Tahoma MS: Wendling came out and spun it with the big boys. The youngster throws a really nice ball and is extremely fundamentally-sound. 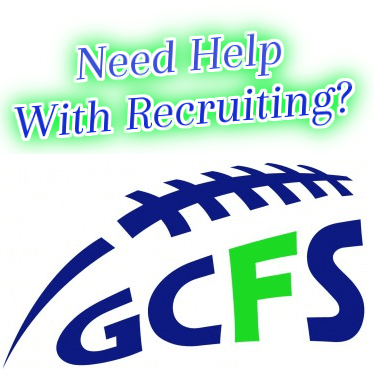 Goy Mal – Emerald Ridge HS: Mal has been a camp junkie this offseason and it’s paying off. He has looked better each time he’s come out and could be in for a big season at Emerald Ridge. Quincy Carter – Kent Meridian HS: Could be the most athletic QB in the state. Even jumped over and played some DB towards the end of the session. He has almost single-handily turned around the Kent Meridian team. Pierre Le Dorze – O’Dea HS: Le Dorze has been heavily focused on baseball this offseason, but came out Sunday and showed he was still the same QB. His arm was as strong as ever, and he threw the ball well. Caleb Lyons – Lakes HS: Lyons is one of the better athletes in the state, and has great speed and elusiveness. His agility and balance make him tough in space, and he turned in a solid day. Drew Wallen – Auburn Riverside HS: What Wallen lacks in speed, he makes up for in virtually every other area. He runs very precise routes, and his catch radius is impressive. Eric Briscoe, Nikhil Lizotte, Ketner Kupp – AC Davis: The WR trio will be as dangerous as any in the state this fall. All three looked extremely good on Sunday. They’re well-coached and catch anything thrown their way. Roy Hyatt – Mt. Spokane HS: Hyatt is one of the better slots in the state. He possesses quickness and jumping ability that make him a desirable target for quarterbacks. He did a lot to help his stock on Sunday. Max Gray – Arlington HS: Gray had one of the best days of any receiver in attendance. He regularly got separation on DB’s during one on ones, and can catch anything within reach. His performance Sunday makes him one of the more intriguing WR prospects in the state. Jayson Williams – Curtis HS: Like Gray, Williams had one of the more impressive days amongst wideouts. The 2015 athlete is dangerous any time he gets his hand on the ball, and will be one to watch this fall. Terence Grady – Kentwood: Grady showed why he is the state’s top receiver on Sunday. If a ball is thrown anywhere near him, he can go up and get it. He has the size and speed to be a playmaker at the next level. Trey Robinson – Jackson: The versatile athlete out of Jackson did not disappoint at the showcase. He is so quick and shifty, and virtually impossible to defend. Bryan Moon – W.F. West: The Bearcats’ wideout has a solid day. He has put in serious work this offseason and it showed. Will be a primary target this fall, and for good reason. Dylan Campbell – Graham Kapowsin: Campbell has looked good every time we’ve seen him this offseason, and Sunday was no different. He is an aggressive playmaker who will be a major factor this season. Jackson Keimig – Bothell HS: When you watch him play, you find yourself in awe that he is just going to be a junior. Is incredibly talented, and has a great work ethic and desire to be great. Chico McClatcher – Federal Way HS: The “blue mamba” had the type of day that showed why so many colleges are seeking his services. His speed, explosiveness and quickness make him one of the top 2015 prospects in the state at any position. Mike Padden – Lakeside School: Padden is a total blue-collar type player. He just busts his tail every time he steps on the field. He has shown tremendous growth this offseason and had one of his better days on Sunday. 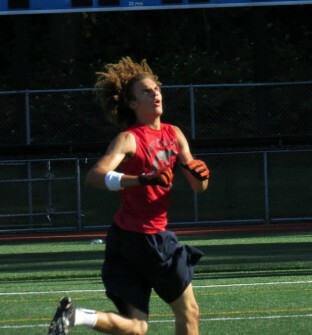 Drew Griffin – Bellarmine Prep: Griffin can play either wideout or DB but got his work in as a receiver Sunday. He had a solid day, regularly getting separation from DB’s and showing good burst out of breaks. Dave Ungerer – Pullman HS: Recently grabbed his first offer from Idaho, comes from great football genes. Shows good athleticism from the slot. J’Maka Love – Lincoln HS: After spending last season under center, Love will be a wideout this fall and should be a top target for the Abes. Had a very good showing Sunday and will transition back to WR with ease. Conner Longoria – Archbishop Murphy: Longoria is another player who can play either WR or DB, but worked with wideouts Sunday. He is deceptively quick and can catch anything. His basketball background helps him utilize great body position against smaller DB’s. Xzavier Weston – Lakes HS: Like his teammate Caleb Lyons, Weston is maybe a bit undersized, but can really scoot to make up for it. Is one of the fastest players on the field, and knows how to get open. Keanu Songcuan – Fife HS: Songcuan is making the move from linebacker to DB this year and is one of the hardest hitter in the state. Showed on Sunday that the change of position shouldn’t be an issue. Keenan Curran – Federal Way HS: Curran has a host of offers, and Sunday he showed why. Can play either safety or corner, and do both at a high level. We think he projects best at corner. Dehonta Hayes – Lincoln HS: Making a case to be the top defensive back in the state of Washington – and he still has two years left to prove it. Should be a heavily recruited prospect before all is said and done. Cooper Murphy – Olympia HS: One of the surprises of the day. Murphy showed he can hold his own against some very talented wide receivers, and is a very technically sound DB. Jordan Sumerlin – Graham Kapowsin HS: Came into the showcase hurt, and still managed to leave everything he had on the field as one of the better DB’s of the day. Dashay Ware – Todd Beamer HS: Another class of 2015 DB with some serious talent. 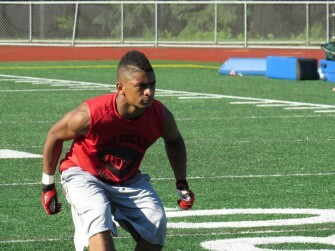 Was the SPSL leader in INT’s last season, and should be one of the top DB’s in the area again this fall. Jorden Payne – Camas HS: Payne is quickly rising the rankings as one of the top defensive backs in Washington. Has really good coverage ability and is definitely a player to keep an eye on this season. Terin Adams – Juanita HS: Adams has really good hips and can turn and run with some of the best in the state. Should be a lockdown type of DB for the Rebs. He also is a member of the super-talented 2015 DB class. Nick White – Jackson HS: White is a very talented and athletic defensive back. He has really good size and shows an ability to play physical. Curtis Russell – Graham Kapowsin HS: Another player from GK who got it done on Sunday, Russell, along with Sumerlin, should make it very difficult for opposing offenses to throw on the Eagles this fall.